These three hats will be added to others for a total of eleven to be sent to Knitting for Noggins. I have sent them other hats in the past. 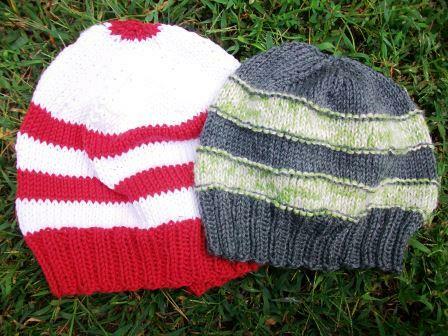 The first two here were made from left over yarns from other projects. 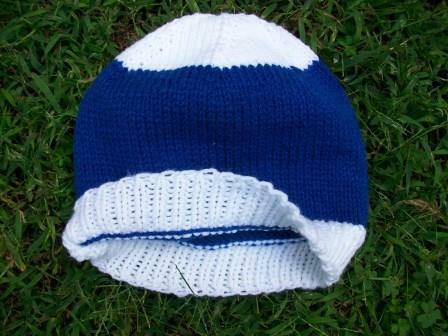 This blue and white hat was made from Red Heart yarn as a "mock up" for a hat I will be making for my husband using wool yarn. I wanted to get the white and blue areas the correct widths per his specifications. Also I noticed that when the white ribbing is turned up there is a blue line so when I knit his I will decrease the ribbing by one row and add a row of stockinette stitch.